As freelancers, we know how important it is to create the perfect project pitch—from research to a targeted cover letter to hand-selecting your best clips and layouts. A moment ago, I said that you don’t have much time for preparation. But that’s not really true. Start by drafting some ideas that take about 20 seconds to say out loud — no longer than 3 to 4 sentences. Every pitch should start with your full name and what you specialize in. 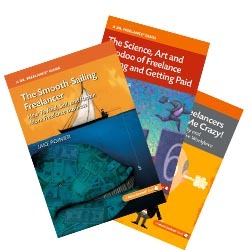 From there, you can progress to frequent clients—local newspapers, magazines, large corporations, doctors—and why you’re the perfect freelancer—expertise in increasing sales, lots of connections, etc. Note: It’s usually best to be prepared to give pitches to variety of possible clients. A magazine editor has different requirements than a CEO who needs help with public relations. There’s a fine line here. You want to memorize your spiel, but you also don’t want to sound like a robot. Practice your “spontaneous” pitch with friends and family. They’ll be able to tell you if it flows or if you sound too mechanical. Want to know what a potential client needs? Ask! You’re trying to sell yourself, but the best way to understand the qualities of the ideal candidate is to ferret out what they are—and then show how you fit the description. There’s no point in giving an elevator pitch if your prospect can’t reach you, so keep a few business cards in your wallet, purse or briefcase. And it’s smart business to show interest in the other party, too, so make sure you ask for their card! Guest poster Lauren Bailey welcomes connections at blauren99@gmail.com. That’s the biggest thing — training myself to keep business cards and post cards for my books, etc., with me at all times. @Devon, most of the time I pull them out of my wallet, but I’ve got them stashed in the glove compartments of both cars, briefcase, computer bag, and my wife has a stash, too. Truly, you never know when you need one — it’s cheap insurance! I have lost count of the number of times I have had to scribble my phone number down on a scrap of paper because I forgot to bring cards out with me. I must remember to carry them more often. RT @UrbanMuseWriter Writers, have you honed your elevator pitch yet? No? Read these tips from @DrFreelance http://dld.bz/affDD. Great tips.